This page describes the underlying hardware (central server and distributed measurement nodes) and the software that make the Ark infrastructure so unique. The combination of the distributed, dedicated measurement nodes, advanced coordination facilities, state-of-the-art measurement tools and execution via either command-line or browser interface. With support from the Department of Homeland Security (DHS) Science & Technology directorate, the National Science Foundation, and contributions from volunteer organizations around the world, CAIDA has built the Ark platform. Anchored by a central server located at the San Diego Supercomputer Center, the Ark platform consists of dedicated measurement nodes located in over 40 countries. These nodes, composed of both 1u servers running FreeBSD and Raspberry Pis running Raspbian, provide a hardware and software platform that offers network researchers the tools to enable both ad hoc and highly coordinated measurement experiments. Though originally we shipped 1u servers running FreeBSD, we now deploy small, inexpensive network measurement nodes, based on the second generation Raspberry Pi. 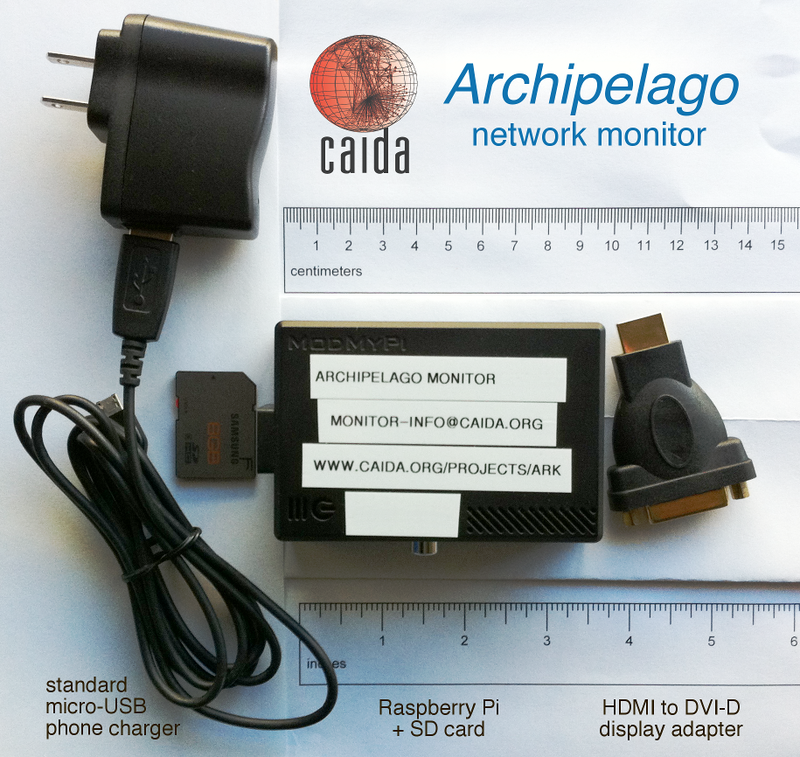 Although tiny, the Raspberry Pi provides low-end desktop-class performance with a flexible Linux-powered programmable platform for conducting networking research. Hosting sites can locate these systems in any convenient location, including on someone's desk, and the transition from deploying traditional rack-mounted servers to Raspberry Pi's has allowed us to scale up the Ark infrastructure. One of the distinguishing features of Ark is its focus on coordination. Coordination, broadly speaking, is concerned with planning, executing, and controlling an ensemble of distributed computations. Coordination is the meta-activity that surrounds a computation. To facilitate coordination, Ark provides a new implementation, called Marinda, of the well-known tuple-space coordination model first introduced by David Gelernter in his Linda coordination language. A tuple space is a distributed shared memory combined with a small number of easy-to-use operations. The tuple space stores tuples, which are arrays of simple values (strings and numbers). Clients retrieve tuples by pattern matching. The tuple space is a many-to-many communication and coordination medium. Over this medium, measurement clients can interact in sophisticated ways, such as exchanging state and triggering actions among monitors. The tuple space abstraction leads to a peer-to-peer architecture, in which participants can be both a client and a server seamlessly. For example, it is simple to write a traceroute service that takes requests and sends responses over the tuple space. We can then layer on top of these traceroute services clients that trigger traceroutes when certain conditions are met. By lowering the barrier to writing and deploying services to just a few lines of code, the tuple space abstraction allows a rich ecosystem of measurement services to thrive, in the same way that HTML empowered users by allowing anyone to become a publisher on the Internet. To enable measurements requiring accurate time synchronization, we are working with Julien Ridoux and Darryl Veitch to deploy RADclock on Ark monitors. As of July 2011, we have deployed RADclock on 28 Ark monitors as well as on several Ark servers. We believe RADclock is the best available solution for highly precise time synchronization over the Internet. We perform traceroute measurements using scamper, a powerful and flexible active measurement tool supporting IPv4, IPv6, traceroute, and ping. Scamper supports TCP-, UDP-, and ICMP-based measurements and Paris traceroute variations. Scamper has been in development for several years by our collaborator Matthew Luckie at the University of Waikato.